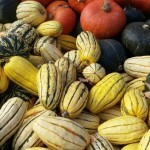 From The Hour: Pumpkins and Squashes and Gourds – Oh My! 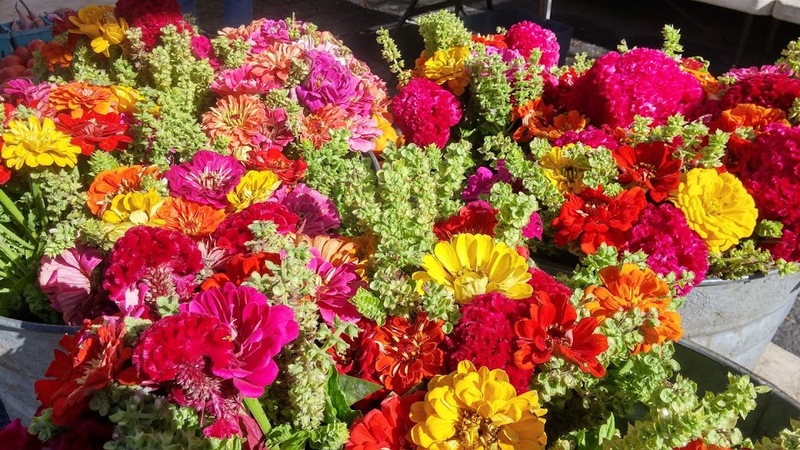 Farmer’s markets are morphing with the seasons into cheerful displays of orange in many shades. 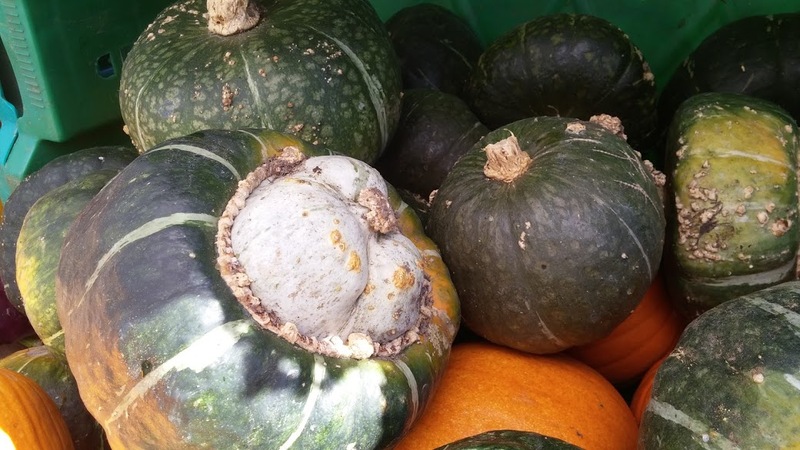 Bright pumpkins, dominating the bins with their substantial size and vibrant hues, are taking over from vivid green and red summer vegetables. 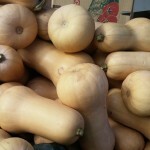 Squash, in multiple colors, shapes, and sizes are great for eating. Gourds, with their fantastic shapes, gaudy colors and varied patterns, are favorites for fall decorations. Pumpkins in their endless array are evaluated by children of all ages for their carving potential. Tall and thin or wide enough to take a big grin, each one suggests a Halloween design. Jack-O-Lanterns – simply carved in classic gap-toothed styles or with artistic and sophisticated designs – begin to grace front yards as we approach October 31. 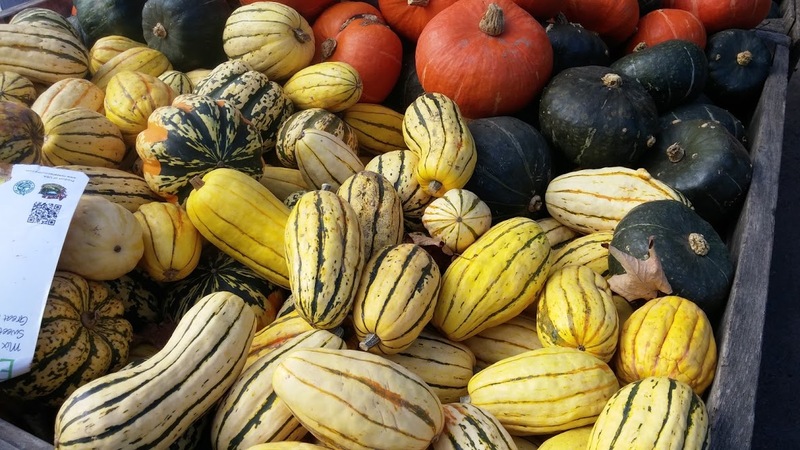 With the increasing interest in heirloom and unusual vegetables, pumpkin possibilities have branched out to include colors from white to gray, a range of orange to yellow, some with multiple colors. Smooth-ribbed skin has given way to bumpy, pebbled or grotesquely distorted surfaces. Contest-weight pumpkins can be big enough to require machinery to move. Others are small enough to make a grouping for a table display. Most popular is a range of one to two feet best for carving. Although you can eat farmstand pumpkins – and they can be very tasty – they’re meant for decoration. The pumpkin in a can for baking pie and bread is a different breed altogether. It’s actually squash. Most of the pie pumpkin for canning is grown around Morton, Illinois, which like the rest of America had some unusual weather this year. Too much spring rain cut the crop almost in half. Don’t wait too long this fall to buy your pumpkin for pie; there won’t be much left as Thanksgiving approaches. Squash are plentiful, though, and a good thing, too. 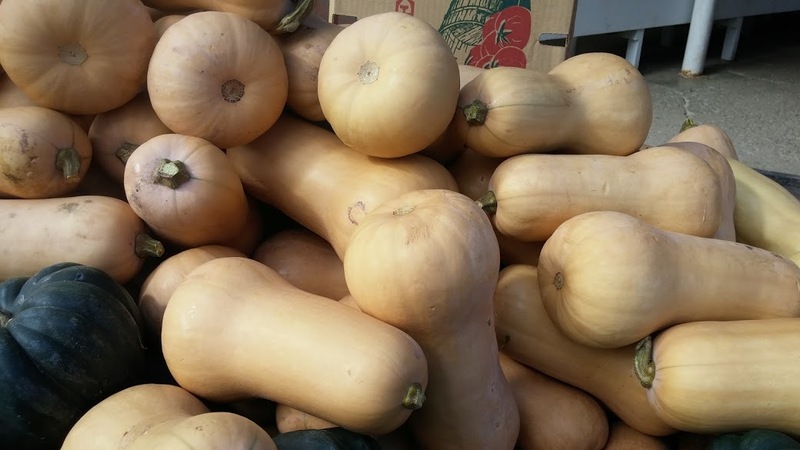 Butternut squash came into its own in recent times as a common, inexpensive, and widely available grocery item. Pioneered by restaurants for soups, on pasta, as a ravioli filling, and in risotto. it has become an everyday ingredient at home, too. Baked, roasted or pureed, its sweet yellow flesh is versatile and easy to cook. It’s even in the stores, already peeled, diced, bagged up, and ready to use. Butternut squash soup is part of the standard recipe repertoire now, but there was a time when it was an exotic item. Chef Albert Stockli, onetime chef-owner of Ridgefield’s famous Stonehenge Inn, pioneered its use and included it in his 1970 cookbook, Splendid Fare. The Swiss-trained Stockli manned the Stonehenge stoves when the restaurant was a destination outpost of continental cooking in Connecticut. His recipe, which included squash, tart apples, rosemary and marjoram, was thickened with egg yolks and heavy cream. At the Silvermine Tavern, the recipe was updated to make a signature Autumn soup by including apple cider and cinnamon while eliminating the eggs. You can see both recipes at www.FranksFeast.com. 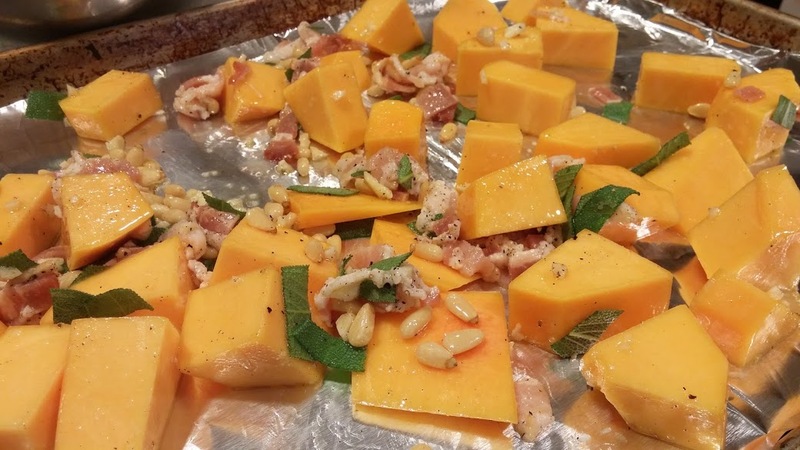 Roasted butternut squash over pasta is a favorite at our house. 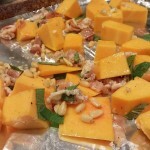 Peel and cube the squash, toss with diced bacon, minced garlic, pine nuts, olive oil, fresh sage, salt and pepper and roast at 400 for about 20 minutes. Toss with hot pasta, grated parmesan, and a little more olive oil if needed. Last week we had a just-picked butternut from Sweet Acre Farm in Lebanon, so fresh that the juice beaded up as I cut. 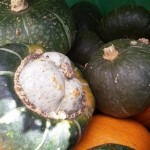 Acorn squash – dark green, heavily ribbed, and tough to cut – has been a fall favorite for years. Split it in half, scrape out the seeds, fill the cavity with some maple syrup or brown sugar and a knob of butter and bake until the flesh is tender. Yum! With rich colors, fanciful shapes, varying textures, random patterns, and many different sizes, gourds are great for display. Yellow, white, green and orange mix together in colorful, seasonal combinations. Bulbous bodies with long curving necks, ribbed torpedo shaped or curved like commas, gourds are diverse and a little weird. I don’t know that anyone eats them. 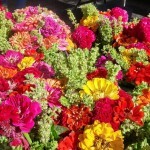 Like cut flowers, they’re pretty, decorative, and can be creatively arranged. Yes, there are still some tempting local veggies at the market: beautiful green beans, the last of the tomatoes and corn, zucchini, of course, and a few other remnants of summer holding on till the first frost. 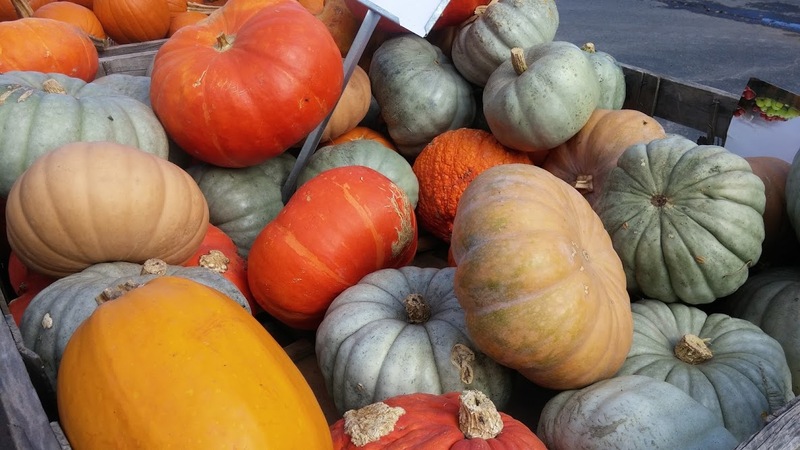 But in October, it’s the colorful pumpkins, squashes and gourds that dominate the vegetable displays and lure me in. Oh my!